connecting head, heart & hands to the Cosmic Heart. The Arkaya Yoga, Mindfulness & Healing Teacher Training is steeped in Classical Yoga, the Siddha mystical traditions of south India and traditional Tantric practices that help one reconnect to life. Yogacharini Maitreyi - founder of Arkaya and lead guru for the program - has been immersed in the yogic life since her childhood in India. She is ceritified formally and is highly regarded in the world Yoga community. She has shared the deeper dimensions of Yoga for two decades in India and around the world. Traditional Tantra is the Way and Alchemy of the Heart. It is a channeling and refinement of emotions, impulses and drives through the purification tools which lead into lightness and joy. You will be balancing the Shive (masculine/consciousness principle) and Shakthi (feminine/power principle) within and aligning with the bliss field. This will automatically allow for traumas to be cleared, old unhealthy habits to be dissolved and to build a strong foundation of resilience, ease and grace. This program will benefit both beginners and teachers of all levels and traditions; anyone who wants to go deeper into Yoga and self-discovery, incorporate mindful practices, learn correct sequencing and Sanskrit pronunciation. Having Maitreyi as a teacher and healer is a unique experience for many reasons. You can feel her deep understanding about mind, body and spirit in a very natural, relaxed way and it is easy to access. The tradition of Yoga, Tantra, Ayurveda and Hinduism is deeply rooted in her presence, which defines her singular mastery. She also feels like a good friend. She understands how the old wisdom can blend with the current mindset in society, giving students very real tools, in a totally demystified way and out of the usually strict and rigid religious protocols. She's not only a loving person but also inspires others to be in love and create friendly communities . This in my opinion is the very best contribution that can be done: to help individuals to create healthy spaces and supporting social evolution. I'm profoundly thankful to get the chance to learn, talk, laugh and feel with her. MAITREYI’S heart sings to see lives blossom into consciousness. She is a practical mystic and international speaker who has presented in upwards of 20 conferences around the world. She has been teaching internationally for over 20 years. Having trained over 50 corporations in self-management, stress management and enlightened leadership as well as having 100+ published articles and poems in leading news dailies and journals. Maitreyi is highly regarded in her home country of India, where she has been given many titles since 1997: Yogacharini (Guide & Visionary), Yoga Chemmal (Expert) and Yoga Shiromany (Gem). 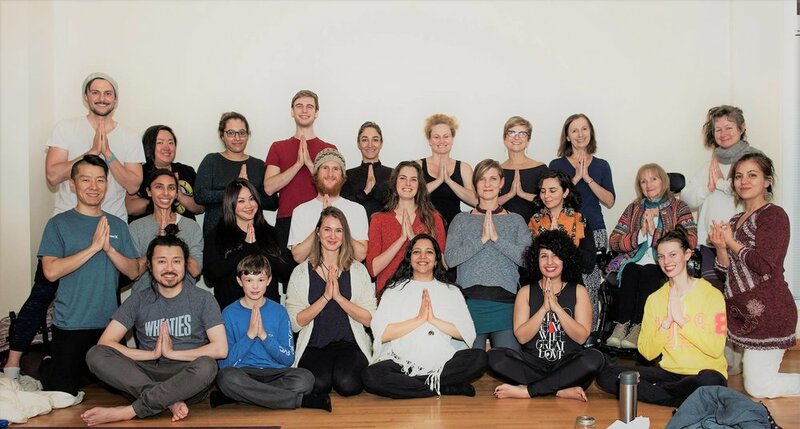 Maitreyi has called Vancouver home for the last two years, after feeling called to build more community while training Arkaya Yoga teachers and healers in and around the city. She greatly enjoys community and communion. Many of us build a tall building without building a strong and stable foundation and wonder why life, be it relationships or work crashes at the smallest disturbance or we live our entire lives walking on eggshells. When things crumble, I take it as an opportunity to go back to the foundation. That is what real yoga teaches us, to go back to the foundation again and again and not be afraid to build a stronger sense of inner security and being. This is essentially a SELF AWARENESS program which enables your Light, lightness and joy to shine through by giving you a structure and technology for evolution. The Guru-student relationship. You will learn in a guru tradition which is how yoga has traditionally been absorbed. The guru is a channel in guiding you to re-parent yourself. The difference between yoga exercise and Yoga. You will absorb the true implications and benefits of the yogic path. You tap into effortless effort while seeing how the yoga class is a structure for life. Arkaya yoga allows you to celebrate life in all its glory and tap into your childlike mirth and goodness. Many positive and subtle paradigm shifts will occur. Multidimensional alignment and healing. Become sensitive to prana or chi or life force and learn to heal yourself and others. The real meaning of Tantra. Tantra from a perspective of working with the Shiva and Shakthi, feminine and masculine, yin and yang within yourself. The Yoga of sound. Chanting Manthra (sacred sounds) with correct pronunciation and intonation. These sounds have the capacity to release old stagnation in the system that cause physical, emotional or mental disease. This creates more ease in your life. The Yoga of Sanskrit with correct pronunciation is included in this. A transformative environment and practices. This helps you to understand and align with the different dimensions you exist in. This increases your self-worth infinitely and will reflect in all areas of your life. You attune to access the great wisdom field and learn to keep that connection. This allows you to expand consciousness and download solutions to life’s challenges. The full-spectrum of Yoga. You will use and properly apply various classical tools like mantra, jathi, kriya, asana, mudra, pranayama and sankalpa to discover and reconnect to your deeper dimensions. Rare practices. Learn the depth of practices and principles for deep subconscious cleansing which are subtle yet powerful. This may bring to the surface unresolved traumas, suppressed emotions and darkness that some may find confusing and painful. This can cause you to want to run away from the discomfort or project the inner struggle onto those around you if you are not aware. When you clear it you will find a new layer of lightness and ease in your system and be free of that layer of limitation. Stability & balance. You will learn the value of balancing the root and second chakras. This builds commitment. When you do this you can clear and dissolve traumas. This will happen in a safe, gentle, down to earth space. It is important to be aware that self judgements, internal enmeshment or armouring can impede this process. This clearing which fully allows you to embody your highest potential is the greatest service you can do for yourself as well as the world. Get your foundation right before you want to jump steps or get hung up on spiritual fantasy. Slowing down is speeding up. Experience the value of consciously slowing down, synchronizing and synthesizing to speed up your evolution. The yoga class is a structure for life. You will learn correct sequencing of an Arkaya Yoga Class and how the class becomes a structure for life. Through the program and the practices, you will begin embodying and exuding what you have absorbed. Arkaya teachers learn to teach from their being and not just from an intellectual understanding. Yoga philosophy, Yogic nourishment, Yoga psychology and Yoga as a way of life - living a yoga life 24/7. Applying the tools to your own life. You will not only learn about the classical yogic tools but also how to apply them to become more connected with yourself and life. This will balance and enhance all areas of your life, including relationships, work, leadership skills and your grounding in the material word. You will learn that Yoga encompasses everything and this helps you to make conscious choices about all areas of your life. You will manifest and meditate from an integrated space and learn to live a life of love. Sharing and teaching as part of your evolution. You will be ready to teach yoga with an understanding of the foundational principles and the deeper implications of this life-path.............. and much more! "Yoga is not just about cultivating a flexible body, but having the flexibility to realign with ones' expanse." NO NEED TO SAY MORE. YES - I AM INTERESTED! CLICK HERE TO TAKE THE NEXT STEP! With a total of 250 hours of training and ongoing mentorship throughout the year, the Arkaya Teacher Training is a unique and in-depth program structured more like the gurukulam system of South India. This training meets and surpasses the Yoga Alliance 200 hour requirement. Once the program is completed, you will be eligible to register as a Yoga Alliance 200 hour yoga teacher. There are four modules which each student must complete in order to receive this certification. This structure is designed to allow for time and space in which integration of the teachings and practices can occur. This builds a strong yogic foundation for manifesting the highest potential in you. This segment will lay the groundwork for the healing retreat by integrating your body, emotions and mind. In a beautifully serene setting, you will delve deep into rebalancing the chakras and sharing partner work (non-sexual) to support each other's evolution. This will be set amidst pristine nature where you will experience connection to your food through freshly prepared and participative organic meals. There will be nature walks, mauna (partly silent retreat), seed chants (bija mantras) and healing methodologies to deepen your connection with yourself. This segment provides the major portion of studio teaching time. You will take part in absorbing the practices and the theory. You will see how the internal work you have moved through will help you become a more effective teacher and leader and pick up the theory faster. It will be holistic and experiential learning as well as intellectual. You will see how this leads to becoming more effective in all of your endeavours in the world as well. Note: there will be a holiday on the Thanksgiving weekend of October 12/13, 2019. This will allow you to experiment with what you have learned by teaching Arkaya community classes in studios and being mentored by senior Arkaya teachers. You will be part of an already established community gaining support and friendship as you continue your evolution as a teacher and beyond. Arkaya community classes will be taking place from December 2019 - April 2020. You will be expected to attend a minimum of 10 classes or more, as well as teach some. All prices are all-inclusive for the four modules (including accommodations and organic vegan meals at Rivendell Retreat Centre for 8 nights) with ongoing mentorship and community after the training is complete. Please Note: Those invited into the program will have the opportunity to pay an early-bird rate before April 1st 2019. In order to maintain quality and individual attention, this will be a small group with a maximum of 12-14 students so we expect it to fill up quite quickly. Pay before April 1st, 2019 and save $300. Full payment is due by July 1, 2019. Those who cannot afford to pay the full amount before the program start, will be considered for a payment plan. This will be considered on a case-by-case basis and is dependent on the level of the student's commitment. Pay the course fee in 3 installments over the duration of the program. First installment: $2000 due before July 1, 2019 to secure your spot. All installments must be received before September 1, 2019. YES - I AM INTERESTED! CLICK HERE TO TAKE THE NEXT STEP! NOT SURE IF THE PROGRAM IS FOR YOU? WHY NOT COME OUT TO ONE OF OUR VANCOUVER YOGA CLASSES TO GET A FEEL FOR OUR COMMUNITY, GET TO KNOW YOGACHARINI MAITREYI AND THE ARKAYA YOGA PRACTICE! THAT SOUNDS GOOD. CLICK HERE TO FIND OUT WHEN THE NEXT ONE IS!